I’ll be honest. I’m a big fan of red wine and enjoy a glass most evenings. So it was especially interesting to me to read some different views on the possible health benefits of drinking wine. There have been many studies done on the effects of alcohol consumption during the past five decades. Most of them report on the benefits and risks of drinking alcohol, including wine, in moderation. Moderation is defined as one drink per day for women and up to two per day for men. A “drink” is 12 ounces of regular beer, 1.5 ounces of distilled spirits and 5 ounces of wine (not the whole glass!). Men can consume more because they are generally bigger and metabolize alcohol faster than women. A number of those studies have shown that, if consumed in moderation, alcohol, specifically wine, can improve health, especially heart health. One study, released in 2003, found men who were moderate drinkers were 30 percent to 35 percent less likely to have a heart attack than those who didn’t drink at all. Another study, from 2016, showed moderate drinking was associated with a 23 percent lower risk of heart disease in women. Additionally, alcohol consumption has been linked to a 30 percent to 40 percent reduction in the risk of Type 2 diabetes. 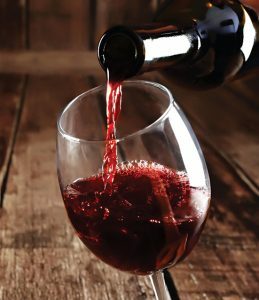 In this article, wine is credited with numerous other health benefits, from reducing the risk of dementia to protecting against sunburn and more. Several studies found it’s the ethanol in wine that’s beneficial. It can increase HDL, or “good” cholesterol, improve insulin sensitivity and slow down the blood’s clotting ability. It can also decrease inflammation inside the arteries. Red wine is the target of many studies on the benefits of drinking alcohol. It contains a chemical called resveratrol and other antioxidants. Red wine provides all of the mentioned benefits and more. Researchers found resveratrol also helps make arteries more flexible, lowering blood pressure. Some suggested it can help people live longer, which caused a surge in the resveratrol supplement business. Don’t uncork a bottle yet. Some more recent studies have suggested wine isn’t the health miracle some people purport it to be. One study, released in March 2017, reanalyzed a number of long-term studies on alcohol and mortality. The researchers discovered the leaders of the studies they reviewed overestimated the benefits of drinking. What they found was a bias in how the researchers defined abstainers, those who stayed away from drinking. The study’s coauthor noted this group included people whose poor health led them to cut down or stop drinking. In light of this, the health and life expectancy of the moderate drinkers appeared especially good. He suggested, in reality, the risks of drinking are the same for everyone and are more significant than previously estimated. This study followed nearly 800 people age 65 and older living in two small villages in Tuscany, Italy. It found that consumption of red wine had no effect on life expectancy, and if it had any benefit at all, it didn’t appear linked to resveratrol. So much for the supplement business! Some other studies have shown alcohol consumption increases the risk for cancer. A 2015 study found drinkers had a 2 percent to 6 percent higher risk. In another, a couple drinks a day was linked to a 26 percent increase in liver, colon and esophageal cancers in men. Women had a 10 percent increased risk for breast cancer. You might think the big reduction in risk of heart disease outweighs the negatives associated with drinking alcohol, and that’s fine. Every article I read on this subject, however, ended the same way: with a reminder if you do decide to drink, do it in moderation. And don’t forget to eat right and exercise to get the best health benefits for your heart – and the rest of your body.